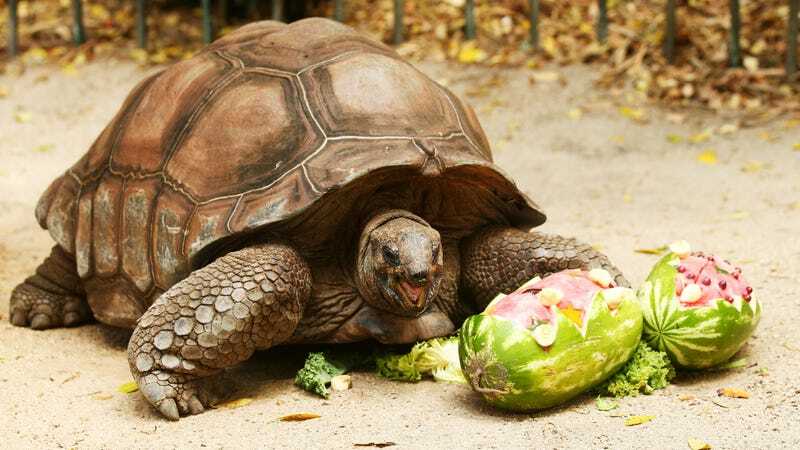 Image of another tortoise via Getty. Sources including DNAinfo and the New York Post report that Millennium, a rare African-spurred tortoise, was stolen from his enclosure at the Alley Pond Environmental Center in Queens. Workers discovered that the nearly 100-year-old reptile wasn’t in his enclosure on Monday, but it’s unclear if the kidnapping happened that day or sometime over the weekend. Animal caretaker Carlos Martinez told the Post that he believes multiple people worked together to steal the animal, since it wouldn’t be easy to carry Millennium—who the Post describes as having the heft of a “hotel mini-fridge” at 95 lbs and a diameter of approximately 2.5 feet—through the waist-height hole cut in his cage. Human footprints led from outside the enclosure to the nearby Northern Boulevard, where worker Sasha Sicard believes a getaway car was waiting. No tortoise tracks were found, obviously. Millennium was something of a local celebrity, participating in walkathons, and attracting an estimated 50,000 visits from school-aged kids each year. “Someone stole him. That’s wrong. Bring him back. He is my friend!” Ethan Lai, 8, told the Post. Another friend of Millennium’s, 7-year-old Charlie Spears, told the Post that he would miss his reptile friend, and that the tortoise had even attended one of his birthday parties. I would have liked to become friends with Millennium too, but didn’t have a chance to meet him when I coincidentally visited the environmental center on Sunday afternoon. I didn’t steal this tortoise (how could you even fit him under your shirt?) but did see some pretty cool turtles and a bird. Workers at the center, the Mayor, and especially this reporter want to see Millennium returned safe and sound. Bring Millennium Home! !